DiaCom's International Corporate Headquarters was specifically designed and constructed for state-of-the-art molded elastomeric diaphragm design and manufacturing. The 30,000 square foot facility, completed during the spring of 1994, had detailed planning and consideration given to material flow, HVAC and electrical systems as well as future expansion. 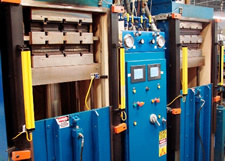 Microprocessor-Controlled Production Presses were designed specifically for the production of fabric-reinforced and homogeneous elastomeric diaphragms. Our new production presses are built with high strength components. The microprocessors closely control the vulcanization process, thus assuring precise, repeatable control of the molding process. The result is high quality, low cost diaphragm production. DiaCom utilizes unique compression and transfer molding processes to maximize efficiencies and insure the dimensional integrity of each part. DiaCom has upgraded its Quality Management System and is now in compliance with the ISO 9001:2008 / AS9100:2009 standards. The AS9100 standard is design for those interested in supplying the aerospace industry and provides a strong focus on product quality, process and material documentation, overall process control and product conformance to specification. The company was founded in 1983 as a supplier of custom and standard diaphragm seals known for reliability and dependability. Today, DiaCom, with worldwide corporate headquarters in Amherst, New Hampshire, focuses on forming strategic customer partnerships critical to the development of unique, technologically superior design solutions linked to its customers' success. As an extension of its customers' design teams, DiaCom offers a broad range of custom diaphragm solutions that are "designed for manufacturing" and as a result, are more comprehensive, robust and cost-effective than competitive products.